BROCKTON, Mass. - The start and finish were drastically different, but it did not have much impact on the final outcome. 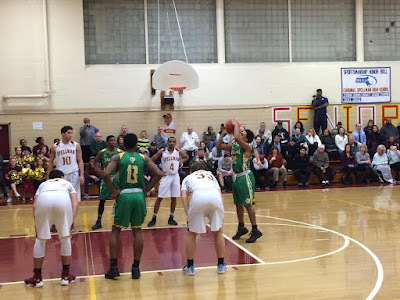 On Tuesday night, Boston Cathedral traveled to Brockton to take on Central Catholic League opponent Cardinal Spellman, and a fast start propelled the Panthers (10-4) to a tight 83-78 road win over the Cardinals (7-4). For most of the game, the fourth quarter especially, the Panthers were outplayed by their foe. It would not matter though, because it took their foe a few minutes to adjust to their aggressive style of play, and those first few minutes made all the difference. The Panthers' aggressive style allowed them to force several turnovers (32 total) and grab offensive rebounds. Because they came out with impressive energy, they jumped out to a quick 10-2 lead. At the beginning of the second half, they led by as many as 17 points. That lead almost disappeared entirely late in the fourth quarter. Cardinal junior Admar Jaramillo hit a 3-pointer with 12.1 seconds left that brought his team within 4 points. The Cardinals biggest problem late was that they ran out of time. Even as he watched his team’s lead deteriorate, Merritt said he was not nervous. Senior guard Calvin Cheek had a strong performance for the Panthers, dropping a team-high 29 points and racked up 11 steals. Junior forward Julian Howell was second on the team with 14 points. Junior Mike Spencer was the Cardinals' high scorer, putting up 24 points, but it wasn't enough to overcome Spellman's slow start.